I met with a group of military spouses in Texas recently as part of the MilSpo Project, an organization created by two military spouses, Elizabeth Boardman and Nicole Hope, who have a mission to help empower and educate their fellow spouses on small business ownership. In our local chapter meeting, we each discussed our professional goals for the next year when the topic of military spouse licensingcame up. One military spouse shared that she was unsure what business she would like to start. She'd taught overseas in Europe and Asia for many years, and though she loved teaching, her analysis of the licensing situation in the U.S. had significantly diminished her interest in continuing her career as an educator. The process seemed too complicated, there were too many seemingly meaningless hoops to jump through, and the process of recertifying in each individual state seemed too daunting. You know there’s a problem when starting a brand new business from scratch seems like a more plausible goal than pursuing an updated license in your current profession. That’s a reality that many military spouses, including myself, have faced, as 34% of all military spouses either work in or have a professional background in a career that requires a license, according to a Blue Star Families survey from 2010. The problems with relicensing have forced many spouses out of their profession of choice. Fortunately, through concerted efforts from numerous military-friendly organizations and the White House initiative Joining Forces, individual state governors have put themselves to task to help ameliorate the relicensure challenges for military spouses. Those pushing for licensure changes are seeking to meet one of three goals for each licensing requirement per state, recognizing that some certifications, such as real estate and law will require state specific knowledge for the purpose of practicing in those states. Obtainable Endorsement provides options to the spouse to show that certification gaps have been met through other means. In my case, that would have been the testing requirement or evidence of having either studied economics through other means or having taught economics. Temporary Licensing allows the spouse to pursue the additional certifying requirements during a probationary/temporary licensing period. Expedited Licensing requires licensing departments and boards to provide a process for expediting review of materials for spouses. After an effort that is merely several short years old, today almost every single state--a total of 47 as of the time of this writing--has either passed a bill to help ease licensing requirements or has made efforts towards supporting the policy, such as by introducing the bill to their legislature. As of October 2015, bills are introduced and currently active in the remaining three states of New York, Pennsylvania, and Wisconsin. You can track the status of these states on USA4MilitaryFamilies, a DoD website focused on supporting military families. Luckily for military spouses, this isn’t the only initiative in employment and licensing that is gaining traction. For one initiative, there is a huge push for either finding or creating employment opportunities for military spouses. If you're seeking employment opportunities as a military spouse, make sure to check out our recently updated Ultimate Guide to Employment for Military Spouses to get started on your career journey. For another big initiative, the Military Spouse Job Continuity Act of 2015 will provide additional licensure benefits to help defray the high cost of relicensing that military spouses face at an inordinately higher rate than their civilian peers. Essentially, this bill would provide a tax credit of up to $500 for qualified relicensing costs for military spouses who relocate to a new state as a result of a PCS. The released summary of the bill states that the credit would be available to those who applied for relicensing for a profession they held in their previous state. For this bill to meet the intent of Congress of helping military spouses relicense, it will require more nuance--for instance, allowing spouses who did not work in their profession in their immediate former PCS station as a result of not finding work in their profession during the course of the duty station, which many military spouses can relate to. This act was introduced in the House on February 26, 2015, by sponsor Rep. Matt Cartwright (D-PA). With 143 bipartisan sponsors, this bill is popular. It was referred to the House Ways and Means Committee, and a similar bill has been introduced in the Senate (S. 920), which has been sent to their Committee on Finance. We look forward to hearing more good news about improving military spouse licensing. 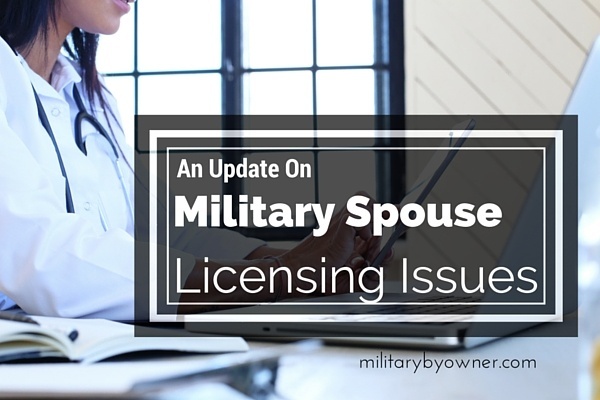 How have military spouse licensing issues impacted you?